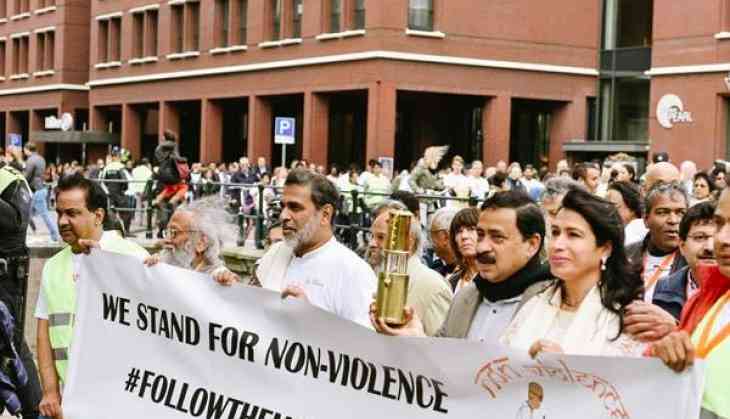 Over 800 people of different ages, nationalities and walks of life participated in a 'Gandhi March' held in The Hague, the seat of Government of the Netherlands on 1 October, as part of a 'Follow the Mahatma' campaign organised to mark the International Day of Non-Violence. The day's proceedings began with the Netherlands Marathi Mandal entertaining participants with traditional dhol and dances inside the compound of the iconic Peace Palace, home to the International Court of Justice and the Permanent Court of Arbitration. Deputy Mayors of The Hague, Rabin Baldewsingh and Karsten Klein as well as Ambassador of India to the Netherlands, Venu Rajamony made brief speeches flagging off the march. A spark taken from the eternal 'World Peace flame' that burns outside the Peace Palace, (created using a flame from the Mahatma Gandhi memorial at Raj Ghat in Delhi) was handed over to the Deputy Mayors and Ambassador Venu Rajamony who led the march along with Ambassadors of many countries, Mr Chan Santokhi, MP and leader of Opposition from Suriname and leaders of the Indian community. The colourful march guided by motorcycle outriders in front and with mounted police on horses at the back, wound through the streets of the city for about an hour before concluding at the historic Grote Kerk or Big Church of The Hague. The marchers wore T shirts specially designed for the occasion with the 'Follow the Mahatma' campaign logo of Gandhiji walking with a stick in one hand and a cycle in the other. They also carried posters and shouted slogans advocating non-violence and peace as well as the teachings of Mahatma Gandhi. Other dignitaries who took part in the activities included the Ambassadors of South Africa, United Kingdom, Austria, Spain, Indonesia, Bangladesh and Sri Lanka, Political leader of Indian origin and celebrity fitness advocate and inspirational speaker Milind Soman, Mr Theo Henrar, Chairman of Tata Steel Nederland, Prof Vinod Subramaniam, Rector Magnificus of Vrije University in Amsterdam, former Members of the Netherlands Parliament R.Ramlal and Tanya Jednand Singh. On reaching the Grote Kerk, the marchers paid respects to a bicycle personally used by Mahatma Gandhi and sent to the Netherlands by the Gandhi Memorial Trust of India as a special gesture, in view of the popularity of cycling in the Netherlands. The cycle will be part of an exhibition on 'Gandhi, King and Mandela' in Amsterdam till early next year. An excerpt of Philp Glass's masterpiece opera titled 'Satyagraha' inspired by Mahatma Gandhi's philosophy of non-violent resistance was performed by artists from the Korzo Theatre and Kwekers in de Kunst. The excerpt which portrayed the conversation between Arjuna and Krishna in the Mahabharata, was performed in a new adaptation with modern Indian dance. A new book in Dutch titled "Gandhi -An illustrated biography" by Indian author Pramod Kapoor and published by Lannoo of Belgium was released during the event. The celebrations ended with a performance of Mahatma Gandhi's favourite songs 'Lead, kindly light',and 'Abide with me' as well as the famous civil rights song 'We shall overcome' by a group from the American Protestant Church of The Hague. The 'Follow the Mahatma' campaign will continue on October 2, 2017 with volunteers fanning out to 22 schools of Netherlands and conducting classes on Mahatma Gandhi and the Importance of non-violence. There will also be a social media campaign inviting people across the country to contribute photos and videos declaring their commitment to non-violence. A multinational meeting will be held in the Peace Palace by the Mahatma Gandhi Foundation with eminent speakers talking about the message of Mahatma Gandhi. Events are also being organised by the Indian community around the statues of Mahatma Gandhi in The Hague, Utrecht and Amsterdam while Indian students are taking the lead to organise a Cleanliness drive in Maastricht University and a discussion in Technical University, Delft.